Syracuse was founded on the western coast of Sicily by Corinthian colonists around 733 BC. From an early date, Syracuse grew in wealth and dominance on the island of Sicily. Syracuse was and ideal location for trade and its fertile lands allowed the Greek culture to flurish. 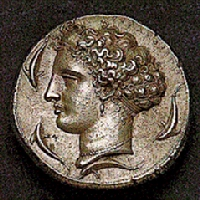 The monetary system of Syracuse began with its first issue of a silver tetradrachm about 510 BC. 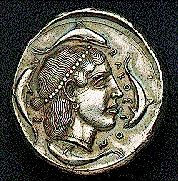 Shortly thereafter, a second denomination was added – didrachm. These earliest issues were marked as to their value by the number of horses dislayed on its obverse – (4 = tetradrachm 2 = didrachm). At first, the reverse was merely an incuse punch made up of four squares. But Syracuse began to display a passion for artistic qualities from this very early age. Soon, the reverse began to incorporate a female head struck within a circle set upon a backdrop of the four incuse squares (see above). The didrachm design was that of a naked youth on horseback leading a second horse to denote its valuation of two drachms. The monetary system of Syracuse began to reflect it growing status within Sicily. Around 490 BC, the coinage began to evolve. While the obverse of the tetradrachm still incorporated a quadriga, the style was now much more refined showing not merely a charioteer, but also Nike flying above and crowing the horses. The reverse took full form displaying a diademed head of Artemis-Arethusa surrounded by dolphins moving clockwise and the name of the city – Syracuse. 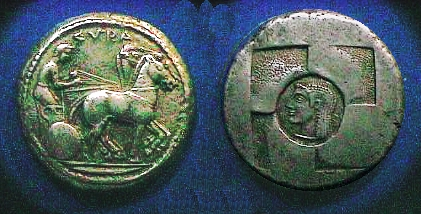 The didrachm retained the naked youth on horseback with the reverse a smaller version of the tetradrachm. In 485 BC, control of the city state fell in the hands of Gelon, the tyrant. For seven years, Gelon sought to rule as much of Sicily as he could making Syracuse his seat of power. Under Gelon’s rule (485-478 BC), Syracuse rose to become the greatest of the Sicilian city states. In 480 BC, Carthage sought to invade Sicily, but was defeated by Gelon at Himera. This great victory over the Carthaginians brought Syracuse to an unquestionable dominant position within Sicily. Following the defeat of the Carthaginians, this great victory was celebrated throughout the land and included a completely redesigned coinage and the addition of the largest silver denomination ever to be issued – Dekadrachm. This victory coinage series is quite distinctive not merely in the finer artistic style, but also the appearance of Artemis-Arethusa wearing an olive wreath. The Dekadrachm is often referred to as a “Demaretion” with respect to Gelon’s wife Demarete who intervened with her husband to spare the remaining Carthaginians. It is said that in gratitude, the Carthaginians sent to Demarete a gift of 100 talents of gold from which this special victory issued is believed to have been struck. The first gold coinage of Syracuse began to appear around 405 BC during the time of Dionysios the Elder. The first gold issue was made up of three denominations with the largest being still quite tiny at 1.17 grams. The second issue began to incorporate slightly larger denominations with the largest being the Octobol with a vaule of 100 silver litrai or 2 Dekadrachms. It was during the time of Dionysios the Elder that we also see the regular issue of silver dekadrachms. This is one of the most celebrated periods in the Greek antiquity and perhaps the zenith in craftmanship. The two artists employed at the time were Kimon and Euaintetos.